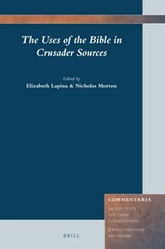 The Uses of the Bible in Crusader Sources sets out to understand the ideology and spirituality of crusading by exploring the biblical imagery and exegetical interpretations which formed its philosophical basis. Medieval authors frequently drew upon scripture when seeking to justify, praise, or censure the deeds of crusading warriors on many frontiers. After all, as the fundamental written manifestation of God’s will for mankind, the Bible was the ultimate authority for contemporary writers when advancing their ideas and framing their world view. This volume explores a broad spectrum of biblically-derived themes surrounding crusading and, by doing so, seeks to better comprehend a thought world in which lethal violence could be deemed justifiable according to Christian theology. Contributors are: Jessalynn Bird, Adam M. Bishop, John D. Cotts, Sini Kangas, Thomas Lecaque, T. J. H. McCarthy, Nicholas Morton, Torben Kjersgaard Nielsen, Luigi Russo, Uri Shachar, Iris Shagrir, Kristin Skottki, Katherine Allen Smith, Thomas W. Smith, Carol Sweetenham, Miriam Rita Tessera, Jan Vandeburie, Julian J. T. Yolles, and Lydia Marie Walker.